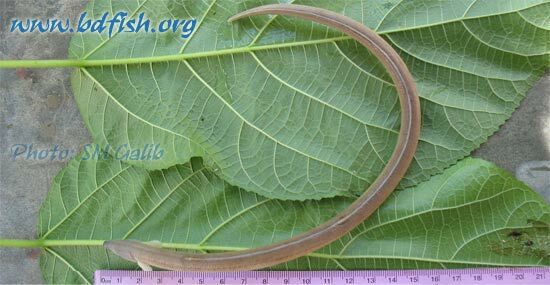 Common name: Longfin snake-eel (Talwar and Jhingran, 1991). Distribution: Bangladesh (Rahman, 1989) and Indo-west Pacific (Talwar and Jhingran, 1991). Morphology: The body is snake-like, cylindrical, and compressed with a long tail. Anterior nostril tubular and posterior nostril along lower edge of lip. Median fin discontinuous posteriorly and dorsal fin starts over front to the middle portion of pectoral fin and extend up to end of the body (Talwar and Jhingran, 1991). Seven pores around eye and lateral line present but body is scaleless (Rahman, 1989). Head 8.5% TL. Height 3.1% TL. Eye 8% HL. Lateral line absent (Galib, 2008). Maximum lengths: 29.3 cm (Galib, 2008), 50 cm (Talwar and Jhingran, 1991) and 108 cm (Rahman, 1989). Habitat: Lagoons and estuaries, entering freshwater (Talwar and Jhingran, 1991). Found in Dakatia river near Chandpur (Rahman, 1989) and Chalan Beel (Galib et al., 2009). Harvesting: Caught incidentally to other species (Talwar and Jhingran, 1991). Economic importance: Non-food fish in Bangladesh. Chaudhuri BL. 1916. Fauna of the Chilka Lake. Fish. Part II. Memoirs of the Indian Museum, 5(5): 441-458. Macleay W. 1881. A descriptive catalogue of Australian fishes. Part IV. Proceedings of the Linnean Society of New South Wales 6(2): 202-387. Munro. 1955. Marine and Freshwater Fishes of Ceylon, p. 97. Rahman. 1978. Bull. Indian Soc. Ichthyologists, 4: 88-91. Rahman AKA. 1989. Freshwater Fishes of Bangladesh, 1st edition, Zoological Society of Bangladesh, Department of Zoology, University of Dhaka, Dhaka-1000, pp. 44-45. Richardson. 1944. Fish, p. 97. Talwar PK and Jhingran AG. 1991. Inland Fishes of India and Adjacent Countries, Vol. I, Oxford & IBH Publishing Co. Pvt. Ltd. New Delhi-Calcutta, p. 87. Visited 620 times, 1 visits today | Have any fisheries relevant question?